Accountant for Pharmacy Wigan, Bolton, Preston and Manchester. Adopting a Tax efficient Structure as part of your business. Making sure gains & losses are correctly recognised. Taking account of any loans to the pharmacy. Making sure you receive prompt monthly VAT Repayments. Saving you money on Tax. Teaching you how to deal with HMRC. Giving you accurate and timely records. Correct administration of your VAT Scheme. Correct administration of your PAYE Scheme. Preparing your pharmacy for sale. Tax efficiency being incorporated in to your business. Helping you avoid late filing penalties. Making sure you grow your business. Tax50 are experts in administrating the Monthly VAT Repayment Scheme correctly. We also have many years experience in dealing with HMRC inspections and investigations. Tax50 will take the burden of compliance off your hands and help you enjoy running your business in a profitable manner. Tax50 gives you advice and guidance with profit extraction strategies. Tax50 will also help you manage your affairs in the most efficient manner possible. The advice from Tax50 is tailored to suit your business and lifestyle requirements, helping you understand how to best increase your income while reducing your expenses. Tax50 will also help you avoid costly late filing penalties. No matter what size of business you have, Tax50 has the right Accounting Solution for you. Let Tax50 help you focus on growing your business. We will make sure you get the best advice. Tax50 want to help your business be successful. Tax50 also has a large network of professionals that can help you with related matters, such as Bridging Loans, Bank Accounts, Residential and Commercial Mortgages (including Buy to Let) and corporate recovery. 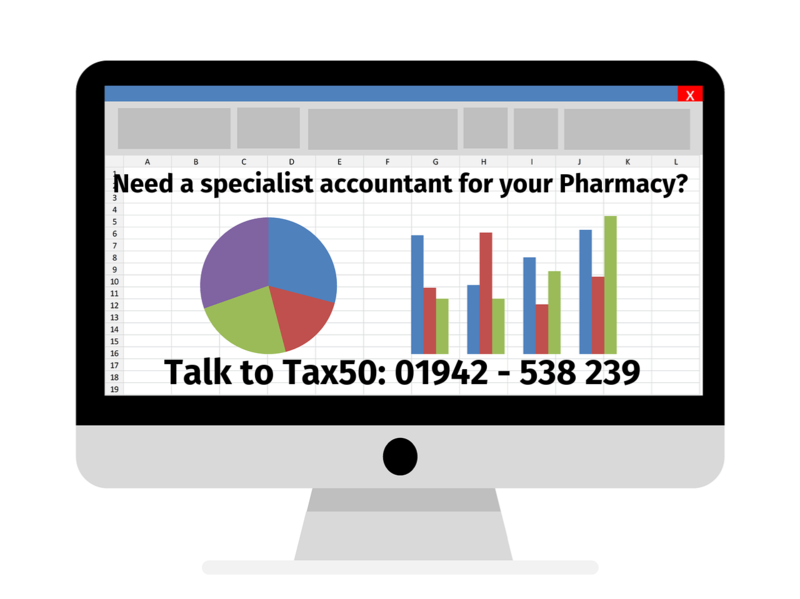 If you are in the pharmacy industry and you are looking for the best advice available to you then Tax50 is the right specialist accountant for you. Contact Tax50 and get your questions answered! Tax50 is an accountant in Wigan serving clients across the UK. We are a specialist accountant, guiding and advising businesses with financial, accounting and taxation matters. If you need an accountant then contact Tax50 and let us show you how we can help you better than anyone else. Tax50 will help you with Bookkeeping, Accounts, Tax Returns, VAT, Corporation Tax, PAYE & C.I.S. Tax50 will help you maximise your profits and limit your exposure to HMRC. Tax50 will make sure you avoid late filing penalties. You and your business deserve the best accountant.